PRODUCT: #9 X 2-1/2" HWH WOODGRIP W/NEO, WITH COLOR PAINTED TOP (red shown). 250/BAG. PRICE/BAG. (#C0461-CCF). Specify color before adding to cart. Shipping Leadtime 4 - 7 days. Available in 48 popular metal roofing colors. 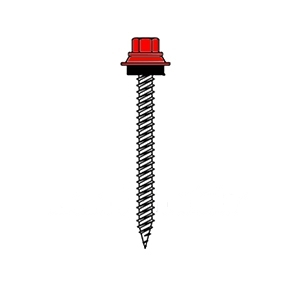 * Self-tapping sharp point screw for fastening metal to wood members. * Self drills through metal panels up to 28 gauge (for heavier metal, TEK type screws are recommended). Painted with Chromagard high-performance color-coating system based on polyurethane coating systems technology. The two-component acrylic polyurethane coating is spray applied to Silver Sentri coated zinc plated fastener head and washer for superior corrosion protection and appearance. Color match is guaranteed for every color and every fastener. Chromagard technology is based on construction and automotive finish systems. Chromagard has superior resistance to installation abrasion for in-place appearance and performance. Hex-head with weatherseal washer. OPTIONS: Available in 3/4 through 3" lengths. 1/4 inch Hex Head Magnetic Nutsetter / Driver Bit, 2-9/16 inch Long. Price/Each.